Well it’s here, the app that makes you really get off your bum and move around whilst still still secure in the knowledge that you are playing a video game. It’s a funny one in that whilst we approached this title with a degree of scepticism, it appears that enough effort has been put into the game to ensure that you will really get something out of the game other than a lacklustre experience. You can use the personal trainer application to great effect and it can really give you a solid work out. Inputting details about yourself helps tailor the experience. Ultimately there are a series of activities, all fairly similar, to do. The cool thing is that they are actually providing your body with a pretty comprehensive sweat if you let it. Graphically the title isn’t one that is going to change the way you look at games. To be honest in retrospect to the other Eyetoy games on the market, this is possibly the one that really justifies the expense of the camera and game. Remember I did say retrospect! The way that the game really brings you in this time has done a better job at immersion than any Eyetoy game that has come before it. Why? Simple. There is no feeling of trying to pretend you are “touching” real items. By that I mean holding. Kinetic simply asks that you move your hand in the appropriate directions whilst making sure you hover over some items and avoid others. There are four “zones” that you play in with Kinetic and they are pretty self-explanatory. Cardio Zone, Mind Zone, Toning Zone and Combat Zone make up the parts that you are going to play in and offer a different experience from each other depending on what level you have attained. 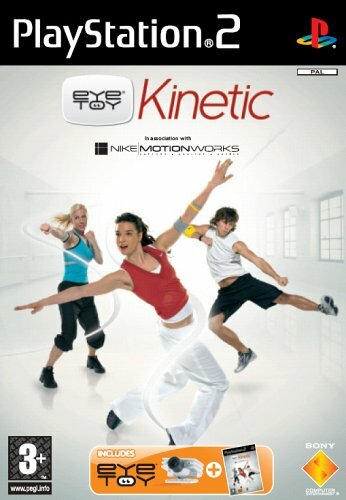 I would have to say that you really should give Kinetic a shot. There are two ways of buying it, either with the camera or without. It really brings something new to the genre and in many ways actually proves the Eyetoy capable of delivering a proper experience for the PS2.